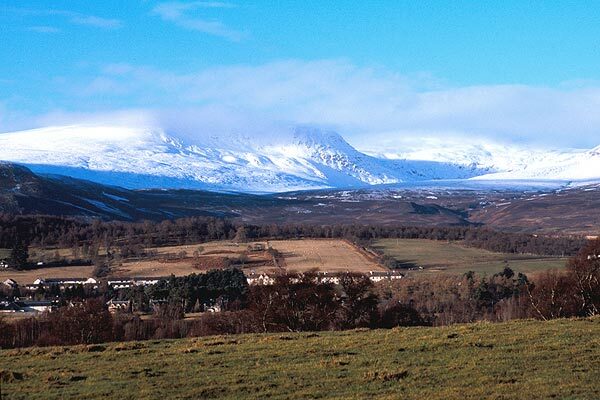 Newtonmore with two of the Monadh Liath hills , A' Chailleach and Carn Sgulain behind. 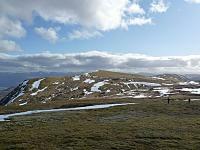 The summary information of one or more ascent routes that include A' Chailleach [Monadh Liath]. 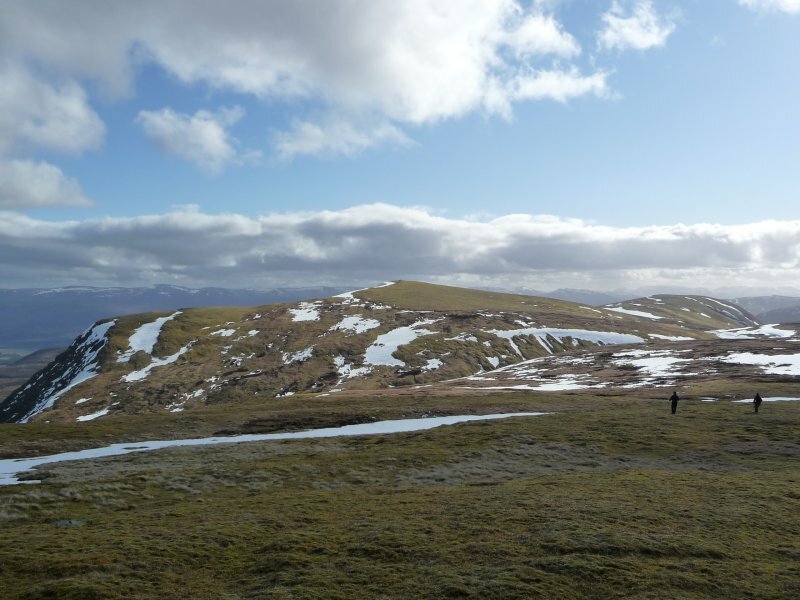 1 803 m 14.04 km 4.5 hrs A' Chailleach [Monadh Liath] and Carn Sgulain Easy route on gentle slopes with no problems other than streams to cross. 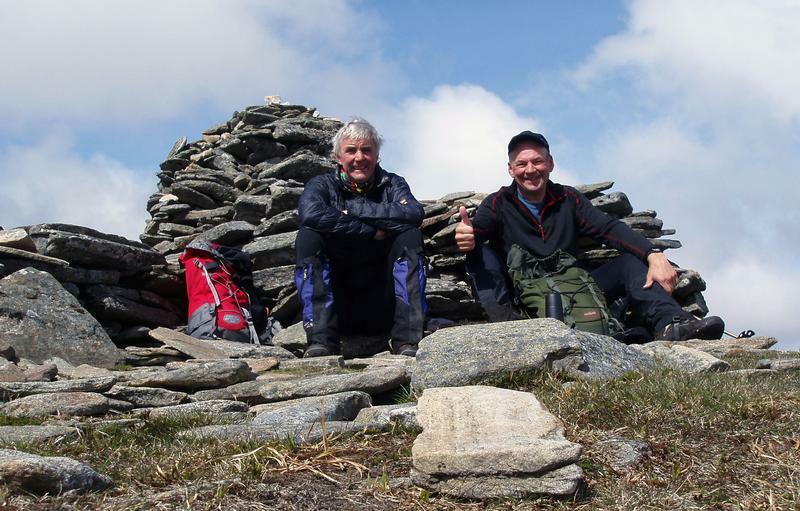 Roy and John in the sun on a summit! 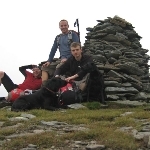 Post a few words about A' Chailleach [Monadh Liath] or read what others have had to say. Did this 27 Aug. whole round inc Carn Dearg. A long day but worth it. On the way to A'Chailleach, look for the footbridge deep in the burn ravine: once past the initial woods and gates after about 1 km, look for a clear path leading left down toward the burn which is nearby at that point. At the end of the day, descending Carn Dearg it's best to get to the "road" by the Allt Fionndrigh, rather than going down Gleann Ballach. Crossing the watershed isn't too bad, if rather wet. There are rather indistinct tracks. Getting back to Shepherd's Bridge after that felt surprisingly easy. Just be aware the narrow glen mentioned (Allt Cuil na Caillich ) is a deep sided burn. In winter it holds alot of snow with several cornices. These can be avoided by following the burn to the east where the slopes are gentler and safer. I agree it's not the most exciting hill but a real good shake down for those ice axe and crampon skills. I lived and grew up in Newtonmore for 10 years and never developed a love for hill climbing. I moved to Glasgow to study and almost immediately I was in the city I wanted to be back in the hills. 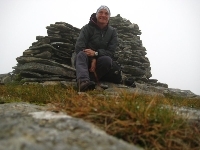 It struck me that "The Old Woman" - A'Chailleach was my local Munro and I had never climbed her. From Shepherds Bridge in Newtonmore I followed the landrover track north, crossed the stream at the end of the track and headed north to the summit. There really is nothing else to report. 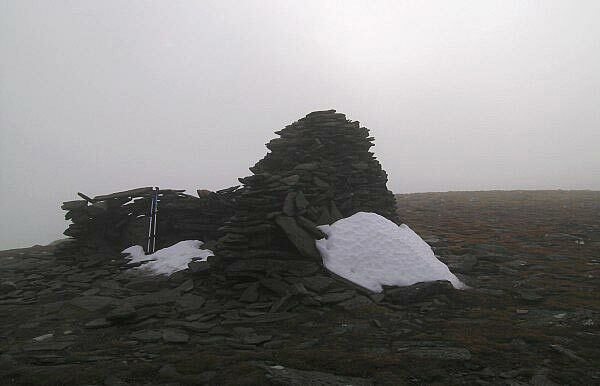 The hill has no redeeming features except a mildly rocky buttress on the eastern slopes of the summit. From the landrover track it is a slow pull up heathery slopes and deep peat hags to a small path 100 meters below the summit. 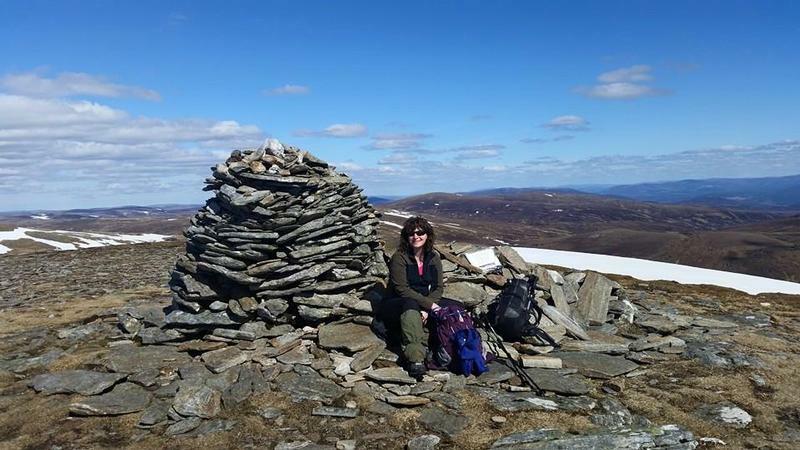 The unremarkable, flat, broad and windy summit gives good views of the Monadh Liath mountains, however, the best view was to the east to the Cairngorm massiv where snow can still be seen on the peaks in june. 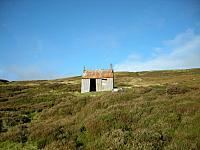 As a local boy, my heart would love me to promote A’Chailleach as a great half-day in the hills. 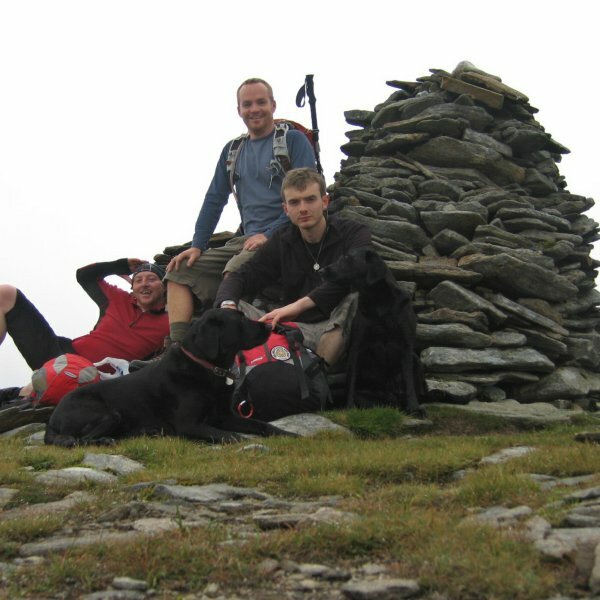 Unfortunately my head says there are probably 283 other Munro’s to better spend your effort on. Once you have left the car park and head up towards Achailleach you should look out for a small foot bridge that is not easily seen on 1:50000 map it is down at the foot of enbankment and covered from sight by trees and foliage. 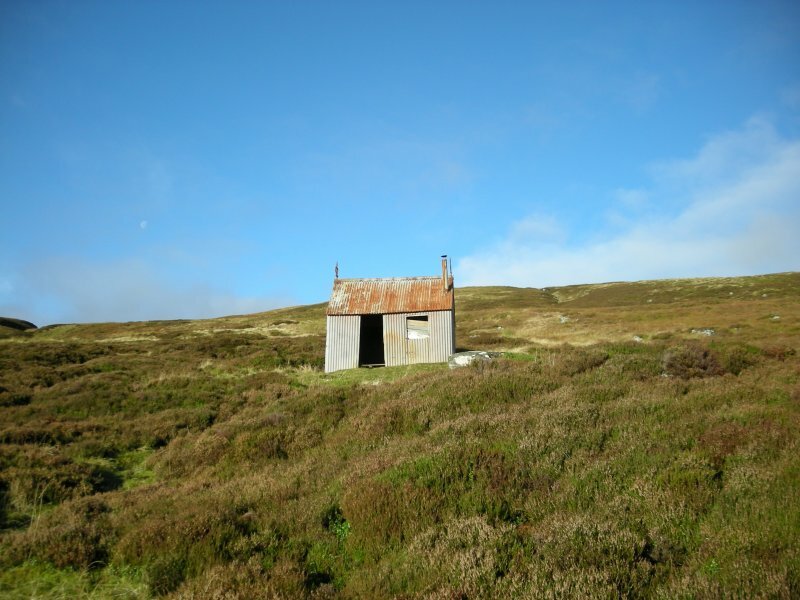 Once over this then it it a case of following the path, not always obvious to see until you reach the Red roofed bothy then on up the path to the sumit. Can be a bit cold when the wind is fresh. A nice walk.